Update: #10 - Debbie - you are a winner! Shadowman was intrigued by some new fabric. 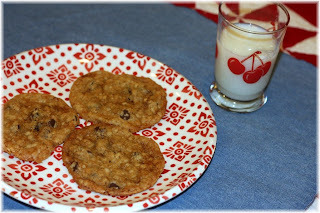 Oatmeal cookies -- pretty tasty. Now, this was very very good -- made by an 11 year old from scratch. So it could have a completely different taste next time :-). -- we all learned there's a big difference in a recipe between confectioners & normal sugar. which comes in fat 1/8s, 1/4s, and charm squares. 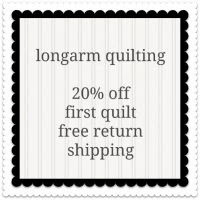 Perfect for quilts, aprons, napkins, I Spy, and much more. Today's giveaway is 2 half yards or 1/4 yard cuts of your favorite food. Leave a comment on what you're hungry for. You are making me hungry for all the bad stuff! I love a cup cake. Cute fabrics. I love the idea of the recipe cards - genius. What i'm hungry for - ice cream and cup cakes? Now I'm really hungry for those food. 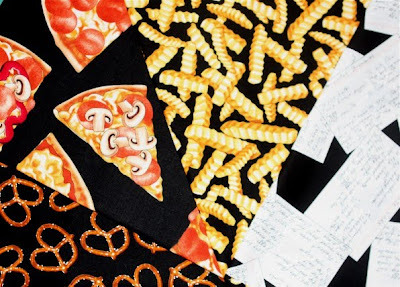 I love PRETZEL FABRIC food black. Cute fabrics! cup cakes. Fabulous fabrics and well done to the masterchef. I am hungry for baked goods, blech to the pretzels (dry, salty...blech!) Bring on sweetness with powdered or regular sugar please. The recipe's !! Def my fav. I would make a new apron for my daughter. i feel like eating junk food!! that fabric made me hungry!! Cupcakes and ice cream!!! Aww so cute! I'll pick the pink fabric with all the desserts on them! What cute napkins that will make! Thanks so much! Oooooh! I think that I am in the mood for cupcakes or pie! YUM!! I love pretzels...real salty ones...but right now im hungry for a bagel with cream cheese. thanks for a chance. Oh the sweet stuff for my sweet tooth pleeezzzz!!! All so very adorable! Thanks for a chance to win this yummyniss. I am hungry for cupcakes and pie. Those fabrics are yummy. I am hungry for cupcakes or ice cream cones!! Yum yum. What a cute boy you have. You are training him well! The first thought was ICE CREAM CONES! I can't have the real ones often due to blood sugar issues. And I do think that the ice cream cones play very nicely with those cupcakes and donuts. Uh...is there any of that chocolate cake left??? I love that pie and cupcake fabric...but the pizza and pretzels sure are cute, too! Cute fabric! I love the pies and doughnuts. I am hungry for cupcakes!!! Since the New Year I have not had any desserts and I am in bad need of something! Dieting, you see. Hard to choose, but I love both the cupcakes and the ice cream cones! Thanks for the chance! It all looks delicious! I think I like the ice cream cones the best! My son has always liked to cook. Nice to see other boys doing it. Glad you stopped by to visit my blog. You really know how to make one hungry! Cupcakes..always!! What cute fabrics!!! Gotta have the ice cream cones and the recipes. Fun stuff! I love it all. The recipe card, fries,Ice cream, all of it. When are they available for the rest of us? Goodness! I need to eat breakfast and now I'm craving sweets. LOL. My favorite foods? Chocolate and ice cream! I'm 35 weeks pregnant with my sixth child, and I'm hungry for everything. Unfortunately, I can't fit a whole meal in my belly with this baby taking up so much space. So fabric food would be great. Thanks! Mmmm - those donuts look yummy, well for that matter so do the ice cream cones and the cupcakes. Cupcakes and fries are my 6 year old chef's favs. He's been in the kitchen for 3 years now and needs a new apron. Thank you for the chance to win. Anything with CHOCOLATE!!! Oh yeah! I'm planning on making lots of cinnamon cookies this weekend. Yum!! Very cute fabric. I love the cupcakes! I've been on a diet for four weeks now, so those cupcakes and ice cream cones sure look good to me! I love those fabrics! All of the fabrics are great! Ohhh, I would have to say I'm hungry for brownies! I can't make them because I can't stay out of them! Getting ready to start a diet (Monday :)) so might just have to make me some to get them out of my system. :) Lovin' my chocolate!!! Thanks for the chance to win! Really cute fabric! I can't choose! They all look so delicious. Please choose for me. And just think--no calories! French Fries! Or Dougnuts! Or Cupcakes! I love them all! I have to get some of these... They would make really fun pot holders! We are having a family party to celebrate my daughter's baptism this weekend, so cupcakes are on the menu! Yum! Plus, I "get" to bake a real cake for the scout cake auction. I'm most hungry for some of your son's oatmeal cookies but the ice cream cone fabric is so cute. But then, cupcakes are ALWAYS a fun treat. That question was hard!! Cute fabrics! I would choose desserts!~ the cupcakes and ice cream cones look so yummy! ;-) Thanks for the fun! I like the pink pie fabric! I would choose the pizza fabric...because I love pizza. But my boys would certainly choose the cupcake fabric because they so rarely get cupcakes and they love them. These would be so much fun added to an I spy quilt....my boys love the idea of the I spy quilts. You are making me hungry with this post! I think it is great when kids learn to cook. It benefits them for the future. I love cupcakes!! And ice cream, french fries---there's not much I don't like. Cute fabrics!! Awesome! I'm hungry for cupcake!!! What fun fabric. I love the cupcakes & donuts! 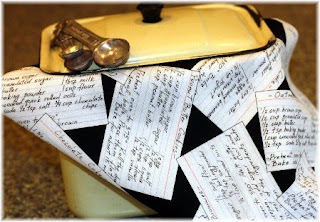 I think the recipe fabric is adorable! My 7 year old son loves to cook and we would have such a fun time with that. All the other fabric: cupcakes, ice cream, pie just makes me hungry and I am trying to be good. I could eat cake till I die. Love the fabrics, I'll go for cupcakes, or ice creams or pies or pizza, LOL, they're so cute! Oh,would have to be cupcakes and pizza. Really cute fabric. Cupcakes, donuts and ice cream, oh my!!!!!!!! enjoy your blog Iwill put you 0n my follower list. Thank you for your comment about my tablerunner. Your little quilt are s adorable.your blog also made me hungry so I think I will eat something. have a great week! oh my! i love the pie and Ice cream cones! I am hungry for guacamole. I would pick cupcakes as one of the fabrics. Thanks! No doubt - cupcakes and ice cream! I may have to go make some! Wow. I love those fabrics. I love food on fabric! haha I have some with chocolate dipped strawberries on it, sitting on my work desk! 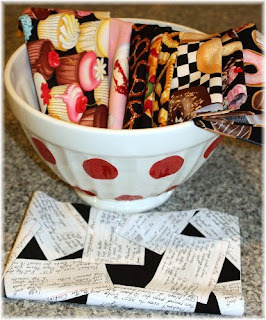 I love the recipes fabric! Looks like Shadow had a great time making the goodies. 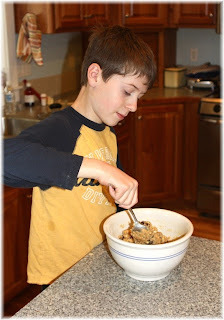 It's always a good idea to teach young boys to cook because, well, they love to eat! I would choose the cupcakes and ice cream! Love them both! I love the recipe card material!! So cute. My favorite foods material would be the ice cream. What a cute line! A charm pack would be perfect for an eye spy blanket! I love your ice cream fabric it looks delicious. Thanks for the great giveaway. I'm always hungry for snack crackers - I'm a carboholic. Love those fabrics! Love the cup cakes...but the recipes would be cool also. Schnibbles patterns arrived today. Thanks. anything with sugar and butter! Cupcakes! Yep, that says it all. I have to say the donuts and cupcakes look yummy to me. 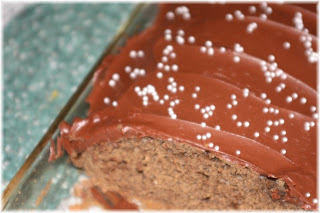 I could go for a piece of spice cake with really good icing. Like an old fashioned refrigerator cake. Thanks for putting that thought in my mind! Thank you so much for your kind comments on my blog! I love getting visitors. I'll be back later to look around some more but it looks like you're a very talented lady! after i see your post. i feel so hungry now. can u send all of them to my home?